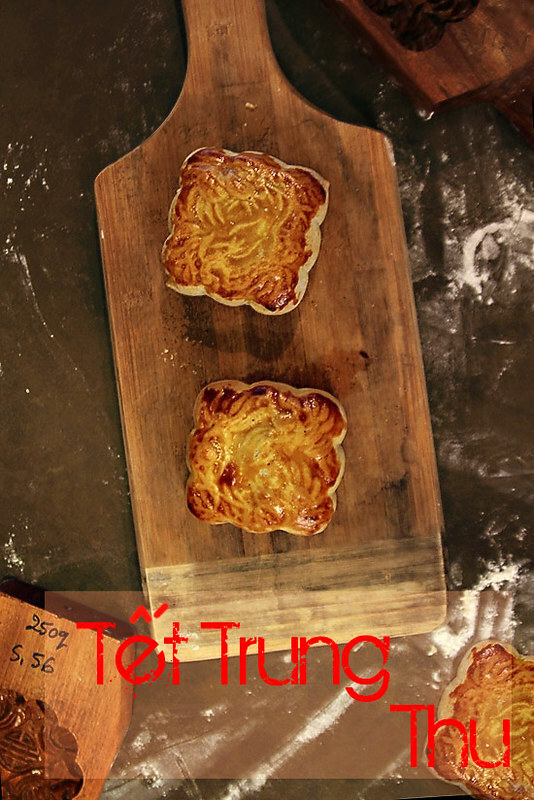 We previously wrote about the meaning of Tet trung thu festival and the ubiquitous and delicious mooncakes but never thought of making them ourselves. We thought it was too complicated to make at home, but fortunately we were proven wrong. 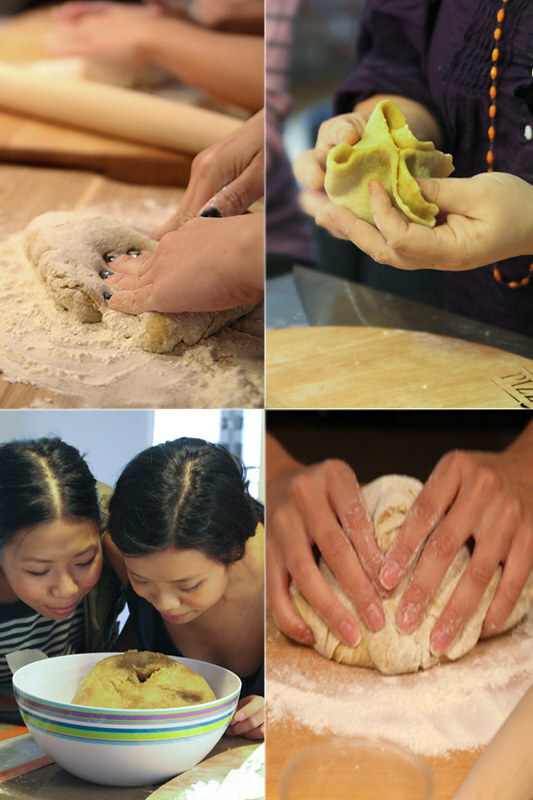 Many moons ago, when Cathy of Gastronomy blog came back from Vietnam with authentic wooden modes for banh trung thu, we got together with friends for an afternoon of baking moon cakes in the middle of spring lead by our fearless leader, Diep of Good Girl Dinette. It didn’t matter if Tet trung thu always falls in September/October of each year, we all wanted to learn. Flour was tossed, eggs beaten and moon cakes we knocked out, literally. There’s always a pent up craving for moon cakes each year as they’re only made during the weeks leading up to the midautumn moon festival. Mooncake stands will pop up at street corners of Vietnam to satisfy the masses. Typically baked, this wheat dough pastry resemble a hockey puck, albiet one that’s much more pleasing to the mouth. They are often filled with lotus seed or bean paste with or without various nuts, dried candied fruits (mứt), salty yolks, and other savories such as sausage, chicken or pork. Baking mooncakes at home isn’t terribly hard, you just need a bit of preparation and special mooncake modes which is often the hardest part to find. Traditional modes are carved from a single block of wood and we’ve only seen them in Vietnam and other parts of Asia. Plastic modes however can occasionally be found in Asian markets, particularly in large Chinatowns so keep an eye out for them the next time you go. Indeed, baking mooncakes is cherished family tradition every autumn with Diep and her family, not unlike a Vietnamese version of Thanksgiving. 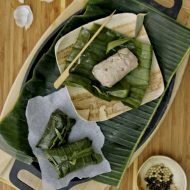 If baked mooncakes aren’t your thing, either due to taste of gluten allergy, try rice flour based ice or snow skin mooncakes with it’s mochi like chew. If you’re up to the challenge, try Diep’s recipe below and have a great Tet trung thu on September 30th! 2. peel and discard skins and mash potatoes. mashed sweet potatoes. let cool. 2. add oil and ginger, and egg yolks. 4. transfer dough to a worktable, for rolling. I would LOVE to try and make something like this! Do you know of any recipes or ingredient substitutes that would make this possible for a Dairy-free Celiac? Thanks for all the great posts! try the nonbaked rice flour versions of mooncake. If you are looking for the plunger type of mooncake moulds, there are plenty on ebay. Thank u chi so much for this mooncake recipe. My search for a quick easy moon cake recipe has officially stopped. I will make them this weekend for my daughter’s birthday. I have a question. How many cakes does this recipe make? 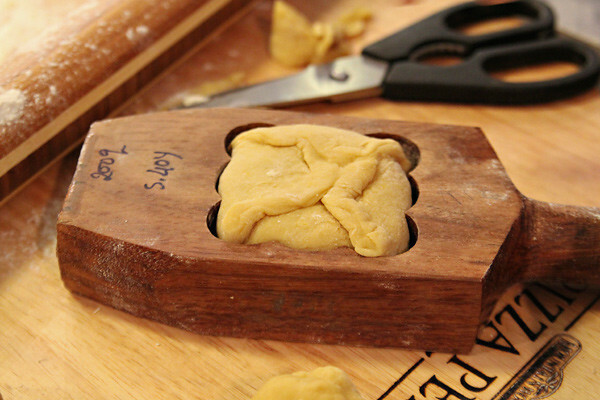 You can find lovely wooden moon cake molds all over Chinatown and also on Clement Street in San Francisco. They’re beautiful! 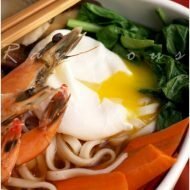 Thank you so much for posting this recipe! I have wanted to make my own moon cakes! I’m in Vietnam right now, and Tet Trung Thu is tonight! (well, it’s been happening all week), and now I’m craving mooncakes more than ever! Mmmm… I”m also absolutely jazzed at your insistence that they are easy to make at home. Can you imagine the possibilities? You could fill that pastry with anything! This is really, really cool. Why the skin after baked turn hard as rock, and it is still hard the next day? we’re not sure, this is our friend diep’s recipe and will ask her. sorry about that! These are so gorgeous!!! good job!! Love these! They look really good! This was a fantastic recipe. I really enjoyed watching the video. 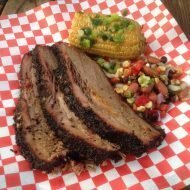 Very good stuff you have here, and really great tasting dishes! I like eat Moon Cakes, Thank you for share. Wow, these look amaaazing! Thank you for sharing, I have added this to my list of “things to make one day”:))) I absolutely love your blog and all your recipes! They look so yummy!! Do you guys have a recipe for the original filling with just the mung beans? I love moon cake! it was always one of my favorite treats as a kid and always looked forward to the moon festival every year. Definitely making this sometime! wow, i love mooncake i wish i can try Vietnam style mooncake :). 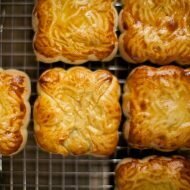 what flavour does vietname style mooncake is offering?